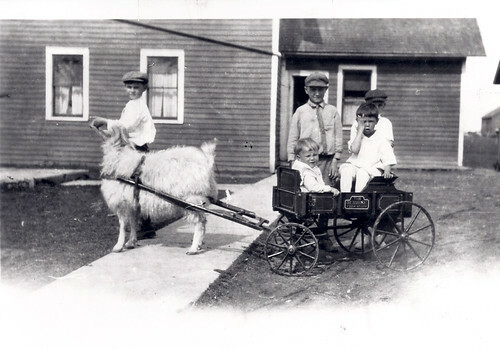 Information on the back of this photo: by the goat: George Busch by the cart: back - John Busch, Chris DeLeeuw, front - Joe DeLeeuw, John DeLeeuw Does anyone know when this photo might have been taken? 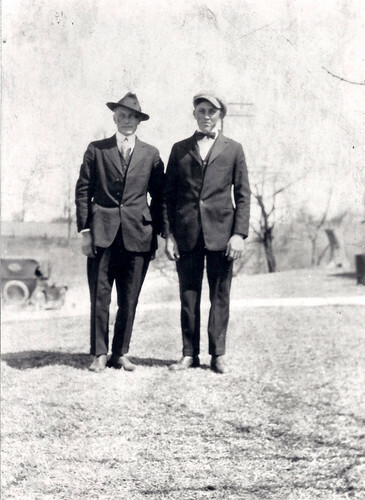 There was no date included on the photo. The old Holy Name convent was moved in March of 1959. They couldn't go down Kimberly Avenue, because there were too many big trees to cut down, so they had to move over frozen ground. They cut across the west church parking field (which is now blacktop parking). You enter the lot from the back into lot owned by George Langenhuizen on Maes Avenue. The building now houses 3 apartments. The moving contractor was Berg and Hen Movers.